One of the most common and most popular of spices, the peppercorn is derived from the berries grown in clusters on the vine-like pepper plant. Round in shape, the berry (peppercorn) of the pepper plant begins as a green berry and then matures from yellowish tan to red and finally black in color. As the peppercorn matures, three common types of peppercorns are harvested at different times, which are the green, the white and the black peppercorns. The green peppercorns are under-ripe berries, which are generally preserved in brine or pickled. Green peppercorns have a fresh, less intense flavor than the black or white peppercorns. The white peppercorn, believed by many to be the best tasting peppercorn, is picked after it is allowed to ripen slightly longer, resulting in a larger berry with a loose outer shell. After the berry is soaked in water the shell is removed before it is dried, a smaller light tan-colored berry is produced that has a smoother skin and a milder flavor. It is basically the same as the black peppercorn without the outer skin. White pepper is generally used in soups, sauces, food spreads, grilled poultry and meats, or for foods that are light colored, such as fish, seafood, and cream sauces where black pepper would detract too much from the appearance. 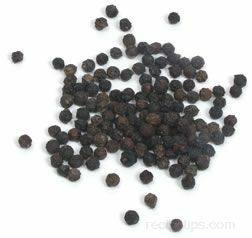 The black peppercorn, which is the most common of all peppercorns, contains the most pungent flavor of all types. It is picked when it is slightly under-ripe (green in color), then dried until the skin shrivels and turns dark brown or black. 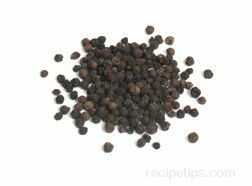 The black peppercorn is used to flavor meats, poultry, fish, seafood, vegetables, soups, stews, sauces, marinades, dressings, baked goods, and a variety of other foods. Since the flavor and aroma of peppercorns will not last long after being ground, it is best to keep peppercorns in a whole form and season foods by grinding the peppercorns with a peppermill as late in the prepartion process as possible. There are a variety of different peppercorns grown throughout the world in areas with tropical climates such as the major peppercorn producing regions of Brazil, India, Indonesia, Madagascar, Malaysia, Sri Lanka, and Thailand. The peppercorn considered to be one of the best tasting with the most flavor is the Indian Tellicherry peppercorn. Other high quality varieties, include the Malabar black peppercorn, the Sarawak black peppercorn and the Lampong black peppercorn from Sumatra. 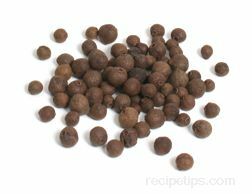 One of the white peppercorns considered to be the most flavorful is the East Indian Mumtok peppercorn. Black and white peppercorns can be stored for up to a year if kept in a cool, dark place. Once the peppercorns are ground, they will keep their flavor for about four months. Once opened, brine packed green peppercorns should be stored in the refrigerator, where they will keep for about 3 weeks.